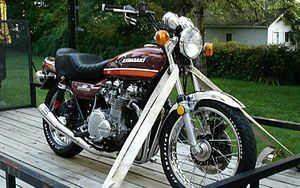 The Kawasaki Z1 is a high performance superbike motorcycle produced by Kawasaki from 1973 to 1975. Kawasaki's earlier two and three-cylinder bikes such as the H1, and H2 had bestowed Kawasaki with a high performance image. But these bikes had known problems: excessive fuel consumption, noise, vibration, and less than perfect handling. Their sparse comfort relegated them to the role of street racer. Kawasaki engineers had outlined these limitations of their two-stroke triples as early as 1967. This led to the beginning stages of planning a four-stroke super cruiser in the mold of the 1000cc Vincent, that could be ridden in any situation, and would be "THE" bike all experienced riders lusted after. 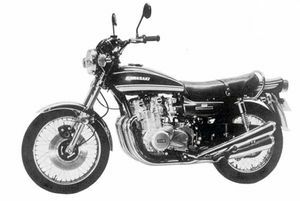 The Kawasaki Z1 gave the world its first true superbike. 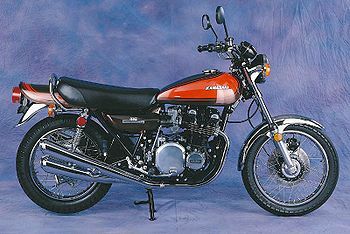 Introduced in late 1972, the Z1 was Kawasaki's first four-cylinder, four-stroke motorcycle. During its planning stages it was called the codenamed the T-103 and nicknamed the 'New York Steak'. 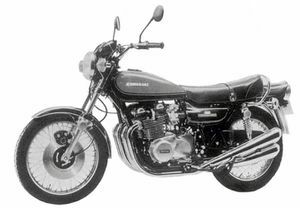 Before the introduction of the Honda CB750K to the world at the October 1968 Toko Motor Show, Kawasaki had already sent a mock-up double overhead camshaft Z1 to US Kawasaki's Sam Tanegashima. Honda's head start caused Kawasaki to be patient and carefully judge the revolutionary bike's impact. The Z1 became the "King of the Road" and an industry leader; as the first production motorcycle to bring such high performance and prestige to the general public. Cycle Magazine recorded a standing quarter mile time of 12.83 seconds @ 101.7 mph. All other manufacturers had to change their mindset to keep up with popularity of this motorcycle. 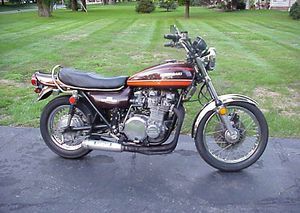 By the end of the decade all Japanese manufacturers had developed machines to rival the Z1 which were almost direct clones of its engine configuration and integral body panels. 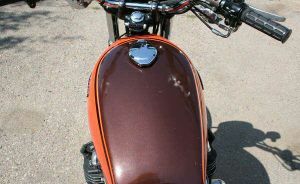 These bike wars directly lead to the demise of the flagging BrItish motorcycle industry.The American motorcycle industry (mainly Harley-Davidson) was also on its last legs and was only saved by radical restructuring and inventive financing. The basic design of the Z1 remained relatively unchanged until the early 1980s with the exception of increased engine displacement (1015cc). This model is also the basis for the motorcycle used by most police forces across the United States to this day. Only recently (2005) did Kawasaki announce that it would discontinue production of the police model, 25 years after the production on the consumer model and 32 years after its introduction. 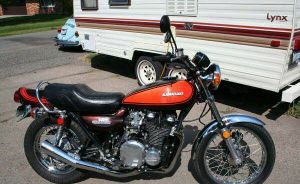 For 1974 Kawasaki changed the colors and markings, and the engine dropped the black paint to simply be an aluminum color. In mid 1974 there was a slight carburetor change to improve cold running. 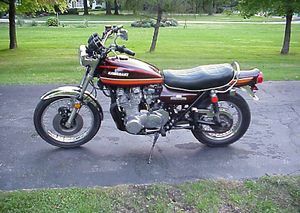 At the end of 1974 Kawasaki had produced over 80,000 units of the Z1 and Z2. Major Changes: Color and marking. Special chain provided with sealed-in grease. Automatic chain oiler discontinued. Kawasaki dropped the automatic chain oiler in favor of an o-ring chain. The front forks received revised dampers and softer springs. To improve low speed running there was a new automatic ignition advance. Unlike on the trend with the H1 these changes didn't drop performance. 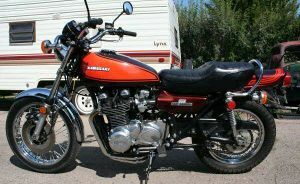 The model designation was changed to KZ900A and started in 1976 with the KZ900-A4 model. This page was last edited on 31 May 2012, at 22:12.